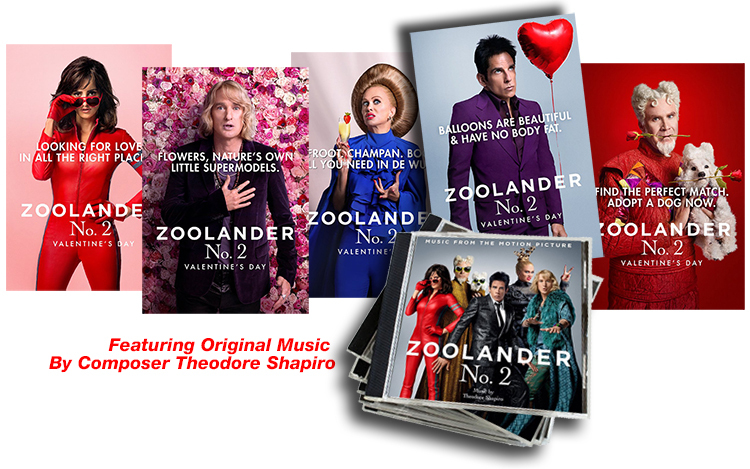 Lakeshore Records has released Zoolander No. 2 - Original Motion Picture Soundtrack digitally on February 12th and will release it on CD March 11. The album features the film’s original score by Theodore Shapiro (TRUMBO, THE DEVIL WEARS PRADA). Theodore Shapiro studied music, wrote a musical about a cryogenically frozen head, and played in a neo-disco band called God at Brown University, and then received a Master’s degree in composition from The Juilliard School. Following Juilliard he began both scoring films and writing commissions for the concert hall, including works performed by the Los Angeles Philharmonic, Seattle Symphony, New York Chamber Symphony, and St. Paul Chamber Orchestra. His recent film work includes the Academy Award nominated TRUMBO, Spy, directed by Paul Feig and starring Melissa McCarthy, Rose Byrne, Jude Law and Jason Statham; The Secret Life Of Walter Mitty (for which he won an International Film Music Critics Award); Ted Melfi’s directorial debut, St. Vincent, starring Bill Murray; the critically acclaimed Sundance Film Festival entry INFINITELY POLAR BEAR, and the hit comedy We’re The Millers. He was nominated for an Emmy for his score to the HBO film, Game Change. Other notable work includes the Ben Stiller-directed action-comedy Tropic Thunder; Marley and Me, The Devil Wears Prada, I Love You, Man, Nancy Meyers’ THE INTERN; and the Oscar-nominated animated film, The Pirates! Band of Misfits. Next up for Shapiro is the Paul Feig-directed reboot of GHOSTBUSTERS, starring Melissa McCarthy and Kristen Wiig. “The ZOOLANDER NO. 2 score features a very large brass section, choir, loads of percussion, and the occasional four-on-the-floor thump of the kick drum,” Shapiro explained. “As the movie descends deeper into mystery, the score develops more and more wildness, with primal horn shrieks and pounding drums."